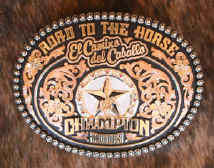 To have been selected as a participant for the renowned "Road to the Horse" is truly an honor. Not only was Richard asked to participate in 2009, but in 2013 Sarah was also invited. To have both father and daughter participate in such an endeavor was truly a thrill for everyone in the family. We're even prouder to have Sarah selected, once again, for the 2017 "Ladies Only" Road to the Horse Competition featuring four top woman clinicians. Keep an eye on this exciting event this year! A few years ago an idea was conceived to have a competition for horsemanship clinicians that would showcase their colt starting skills. 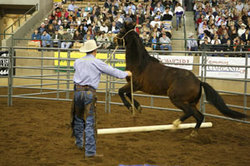 Implementing young unbroken horses, a specified time frame, and strict guidelines that would be administered, the clinicians would be judged on their horse handling techniques by a panel of distinguished judges. 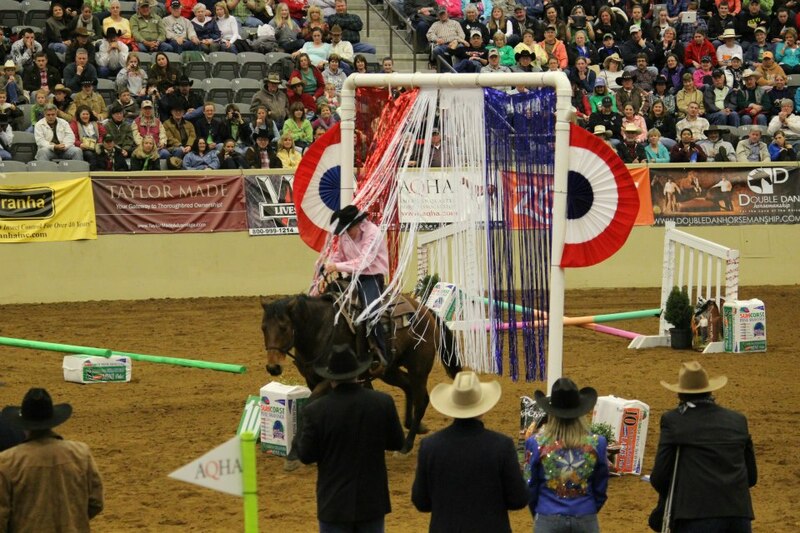 The biggest and greatest of all of these events, in the entire world, was held again this year in Franklin, Tennessee on March 14-15. 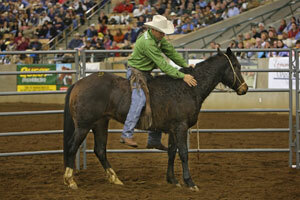 Each year, a group of three-year-old colts are selected from one of the country’s top producing ranches. This year the Bath Brothers Ranch from Wyoming brought a set of range raised colts that had halters put on them for two day as weanlings and then turned out in the wild for the next two and a half years. We each drew numbers and then had five minutes to choose one of the colts from the remuda. Tommy drew first and picked the colt that I thought I wanted (thank God for unanswered prayers!). I drew second and picked a bay gelding who seemed to have a soft yet curious eye. John was the last to draw and he actually picked my third choice. In situations like this I try to make an educated guess, however, that’s exactly what it is -- a guess! We had an hour and ten minutes to work with our colt on the first day with a mandatory ten minute break. For the first twenty minutes of the competition, I was beginning to have second thoughts about my pick. While John was rubbing and petting his colt and had ropes all over him, I couldn’t even touch mine. About halfway through the first session, I made the administrative decision to invite my colt to a “neck-tie party” which is cowboy lingo for “I roped him!” Now, with a connection to this colt, I could start to make some progress. Soon the halter was on and I was rubbing him all over. By the end of round one I had also climbed up on his back. At the end of day one the crowd was leaning towards John Lyons who had his colt desensitized very well, was following him around, and he even had him saddled. Tommy Garland had his hands full with a colt that made him work for every inch of progress made. My daughter, Sarah, was my pen wrangler who helped with equipment and kept track of time. She reassured me that I finished my session on a pretty good note and that I was well prepared for day two. In round two we were given two hours and twenty minutes to work our colt’s in the round pen, with a twenty minute mandatory rest for the horses. My greatest concern, stepping into the pen, was that my colt would have to again be roped and that he would not let me step up and halter him. I was relieved when five minutes later he was quietly haltered and reviewing the previous day’s lesson. 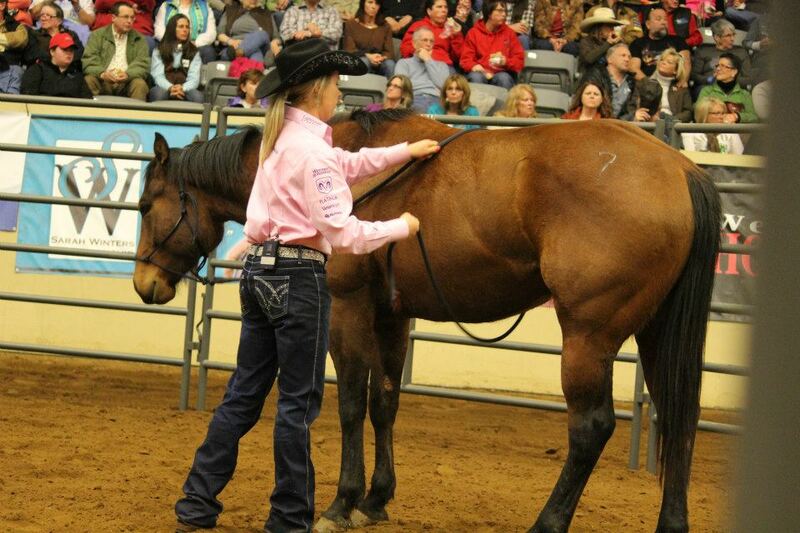 My next goal was to get him saddled. The sooner he had the saddle on his back, the more time he would have to get acclimated to it. I wanted him wearing that saddle before I took my first break. 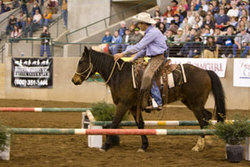 The contest culminates with rail work, an obstacle course, and a freestyle exhibition showcasing our horse. In preparation for the obstacle course each of us competitors added an array of objects in our pens at the beginning of round one. I had two round poles, a tarp, a two by four wooden bridge, and half of a hay bale. Some spectators were concerned and wondered why I did not have more elaborate paraphernalia compared with the other two clinicians. We would just have to wait and see if this was a good call or not. I was pleased with the way my colt moved around the pen with the saddle on. He never did offer to buck, which is not the norm, but it didn’t hurt me feelings. Then it was time to climb aboard. I prepared my colt as well as I could on the ground, with the time I was given, and it wasn’t long before he was moving out each way at the walk and trot. The lope was difficult for him in the round pen and I only managed a few strides in each direction. I trusted that when I rode him outside for the rail work and obstacle course that he would move out freer. By the end of round two both John and Tommy were up on their colt’s as well. Tommy felt like his horse wanted to buck every time he asked for the lope and John was concerned (as I was with my colt), that he didn’t have as much forward movement at the lope as he wanted. At the end of round two we were required to unsaddle our colt’s and put them back in their pens to rest while the obstacle course was put in place. We drew for the order of round three and I was to be last. Each clinician would now have thirty-five minutes to bring his colt into the arena, re-saddle, mount and dismount, pick up all four feet, walk, trot, and lope in both directions, and back up. We would then need to negotiate a myriad of obstacles such as; serpentine poles, crossing a tarp, raised walk-over’s, jumps, swing a rope over our horse’s head, drag a pole, and a mystery obstacle which ended up being caged, live chickens, that we were to ride up to and have our horses put their noses on. After this was completed, whatever minutes remained would be given to freestyle. I waited on the side-lines observing Tommy and John work their way through a myriad of requirements. I was impressed with how both horsemen were able to navigate each required obstacle. It did appear however, that neither trainer was pleased with the lack of forward impulsion their colt’s were able to give them and the loping became very difficult. In the freestyle, John rode his horse up onto a bridge full of potted plants and Tommy stood up on his colt and cracked a whip. Now, it was my turn to see what my colt and I could accomplish. I was concerned when I first brought him back into the arena. He was now all by himself and was really thinking about that back gate. He had been standing out in the catch pen for over an hour, with all the other horses, and wasn’t too sure that being in this big scary arena, surrounded by 6,000 humans, was the best place for him. I figured that the best thing I could do was to get mounted and get him busy. You know what they say, “Idle hooves are the devil’s workshop!” My earlier hunch was correct, getting out of the round pen helped to free up his feet and when it came time to lope left and right, he moved out really nice and free. He handled every obstacle well and even stepped up and kissed some chickens! Some of the preparation I had done in the round pen, with backing, paid big dividends. When I asked him to back up, my horse was soft, straight, and willing. 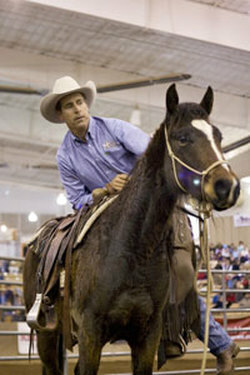 My background and training style reflects the California Reined Cow Horse and Vaquero traditions. 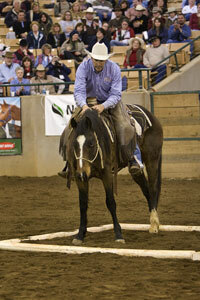 I had the opportunity to highlight some of those traditions during my demonstrations throughout the weekend. With a few minutes left for freestyle I had an idea that would compliment my cow horse background if I could pull it off without getting killed! With just a few minutes remaining I motioned to the back gate and they kicked out a cow. I thought it would be a great thing if this colt could step up to this cow and get curious and start tracking him around the pen. He could not have been better! That cow came out and ran straight towards us and I encouraged my colt forward, the cow took off and we loped around the entire arena tracking up to that cow. My wife says the crowd went wild! That was it for me and I and I rode out of the pen, waiting for the judges’ decision. John, Tommy, and I got back on our own personal horses and rode into the flag filled arena to await the announcement; “And the winner of Road to the Horse 2009 is…Richard Winters!” The fireworks went off and the Cowgirl Chicks took off at a full gallop and I fell in right behind them. I have been in numerous competitions and have known the thrill of victory and the agony of defeat but being proclaimed Champion of Road to the Horse 2009 is a win that I’ll never forget! The award ceremony was like Christmas in March! Receiving a check for $10,000 from Road to the Horse producer Tootie Bland, a memorial Steven “Dookie” Bland trophy saddle provided by Martin Saddlery featuring conchos by Gist Silversmith, and an original painting by artist Peter Grant entitled “On the Road” which was featured as the cover image of the event’s souvenir program, a logo embossed CSI saddle pad, and a beautiful Gist Silversmith’s Masters Collection gold buckle made this win very exciting. Fort Dodge stepped up to the plate and sponsored a $15,000 check to the charity of the winner’s choice. My wife, Cheryl, and I are honored to have Focus on the Family receive this generous donation. 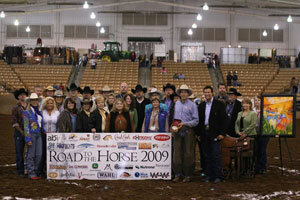 Road to the Horse, in Lexington, Kentucky, was our first stop on our Mid-West Horsemanship Tour. After competing and winning the event in 2009, I've had the privilege of providing the commentary as Horseman's Host for the past 3 years. However, the big deal is that our daughter Sarah was asked to be a competitor this year, at their 10th Anniversary. Needless to say, Cheryl and I are extremely proud of her performance! 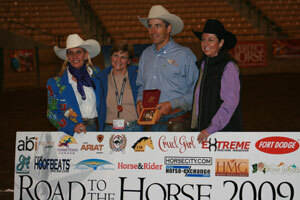 ​The following are Sarah's thoughts and reflections of Road to the Horse 2013. It’s hard to believe that it is all over! These last few months have been such a whirlwind. It seems we have done nothing but eat, sleep, and breathe Road to the Horse. The preparations were endless. 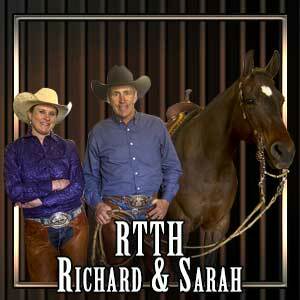 In the process, Sarah Winters Horsemanship was formed, and all of the responsibilities that came along with it. Talk about a learning experience! It is amazing how fast something can come together when one puts their mind to it. (And how much money can be spent in the process!) Everything from a business website, business cards, Facebook page, business license, business cards, posters, banners for the booth, booth design, people to run the booth, interviews, travel arrangements…. the list seems to be endless. It was easy to forget that we were heading to Kentucky to start a colt! The weekend of the competition is one that I will never forget, and looking back I have nothing but wonderful memories. From the 6666’s remuda of 12 horses, I chose a bay colt by Playboys Buck Fever that I nicknamed Patrick. (The competition was held during St. Patricks Day weekend.) In true 6666 form, he was a big, cool looking, good minded, ranchy type horse. Once the competition started, it took a bit for me to actually get my hands on him (I think I was the last competitor to do so in the first round), but once we made the connection he really came around and wanted to get along. Over the three days there were 3 round pen work sessions that added up to 4 hours of total working time. On the third day the round pens were taken down, and an obstacle course was set up, which would be the final test for our colts. I was very comfortable with where Patrick and I ended after our round pen sessions. creeping our way up and only 2 points behind first place. Round 3 was another good round for us, which was spent solidifying things we did in round two. I knew there would be many different challenges expected of the competitors during the obstacle course, that was to come later, so I tried to set up as many scenarios as I could in the round pen to replicate what might take place outside. I swung my rope, drug a log, rode over tarps, bridges, poles, and small jumps. After round 3 we were in the lead by 8 points! 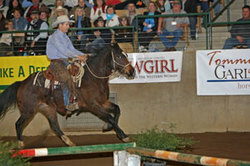 Directly following the three round pen sessions we proceeded to the rail work and obstacle course, in the big arena. The rail work consisted of walking, trotting and loping in both directions, 180 degree turns, backing up, and leading the horse. (Which was actually a big deal with colts that weren’t even halter broke just two days earlier.) One of our biggest challenges while in the round pen was getting Patrick to move forward so it was great to get him out in the big arena! Although Patrick had his own ideas as to whether or not he wanted to stay on the rail of the arena, we did get through it! It amazes me how these colts maneuver through the obstacle course year after year. I don’t even know if my broke horse would go through these challenge courses! We were expected to do everything from walking through narrow and scary-­‐looking serpentines, over tarps, pinwheels, poles, jumps, swinging a rope, dragging a log, opening and closing a gate, and walking through a “car-­‐wash.” I was so proud of Patrick. The only obstacle we were unable to complete was the final “mystery” obstacle, which was worth 20 points per judge! It was a pretty high platform with sparkly fringe surrounding the bottom. (Guy was the envy of us all as he was the only one to conquer this obstacle!) If time allowed we were able to perform a freestyle of our choosing. Opting to pass over the mystery obstacle, I nodded my head for a steer to be let into the arena so that Patrick could hook up to it and track it around. 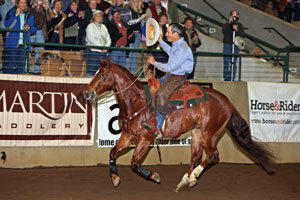 When all the dust was settled, Guy McLean was crowned the 2013 Road to the Horse Champion! He put in a very deserving last round, culminating with riding his colt around the arena without a bridle for his freestyle. I am so grateful that Tootie Bland gave me this amazing opportunity! Her crew, along with all the fans that filled the Kentucky complex, are evidence of the high caliber people involved in the horse industry. The most memorable highlight of this Road to the Horse journey was the opportunity of getting to know the other three competitors. Dan James, Guy McLean, and Obbie Schlom are to be respected not only as incredible horsemen/woman, but as individuals as well. I am leaving Kentucky not only with a wealth of new experiences but also with three new life-­‐long friends!